Have not been very creative of late and months ago my cousin sent me some Bratz dolls and in return I said I would do her a fairy for her Christmas tree. 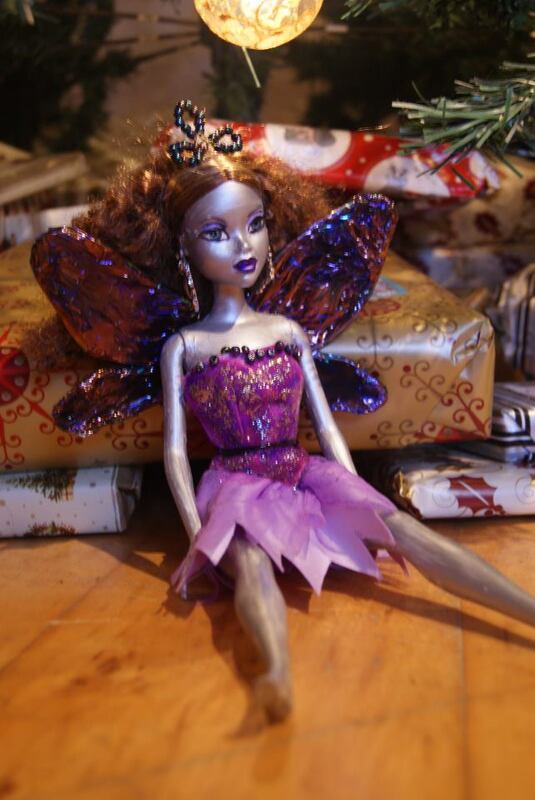 So here she is sat under my Christmas tree,posing for a photo shoot! Hope my cousin loves her and she does not bear down the top of the her Christmas tree! All of the above pictures have Friendly plastic in them, i think I am well and truly hooked on friendly plastic now! ................At what I hope to finish off today,still with the friendly plastic, I have been making tube beads and making them in to something beautiful. Here is a couple of beads I have completed,just waiting now for posty to bring me my E6000 glue!! I have been making friendly plastic beads and then constructing them into various pieces. So much fun to do and every one a unique piece too. Thank you for stopping by. I hope you enjoy your blog stop. I am wife,mother and mixed media artist. I have been creative nearly all my life and love creating new things and changing old things into new things. I like to create unique objects and love to recycle.